The platform in mechanics pit from Evolving Workshop Technologies (EWT) is an elevating work platform (EWP) that is customisable to fit in mechanical service pits. The pit is designed to improve productivity, and help retain top mechanics and technicians. Mining equipment has very diverse ground clearances, this means a standard pit is very restricted to gain underside access. With a platform in mechanics pit added to the standard pit, it’s depth becomes infinitely adjustable via radio remote control to allow the perfect height for the fastest way to get the mine machine working. Pits allow multi-level working, underneath at the side and on top, all at the same time, unlike hoists that can only permit slow underside access, with the immense risk of crushing people and damaging equipment when they fail. Platforms can be custom-designed to meet the specific needs of each pit. EWT has made this possible by redesigning and patenting a cable suspension system so it can even be retrofitted to existing pits, but is best suited to new deeper pits. The platform in mechanics pit has several core advantages over standard pit or truck hoists. When not in use, the pit area can still be used as floor space, rather than the traditional pit solution, which requires covers or barricades, or hoists that are fixed in place or have to be stowed. 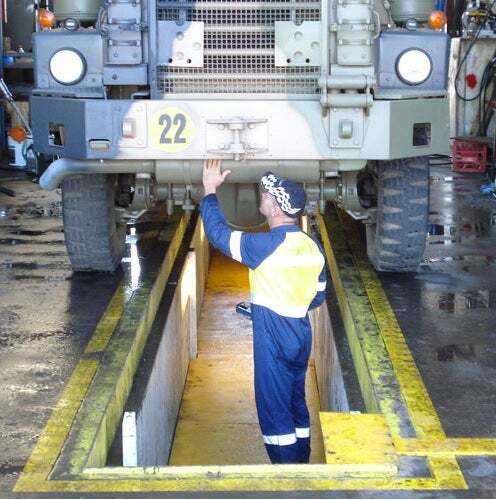 Underside access to vehicles is also much faster with the platform in mechanics pit than other methods. Most mine machinery can’t be hoisted. EWT operate under the idea that it’s easier to move the mechanic than moving the machine. Safety is an important feature of any apparatus used within industrial workshops. The platform in mechanics pit has counter-balance valving, which stops the platform from descending in the case of a hose failure and prevents hydraulic creep. The valve also prevents over-loading, and if the platform weight is exceeded, permits a controlled descent to a height that is more appropriate for the load. The standard safe working load (SWL) of a platform is 900kg, though this can be engineered to suit specific requirements. Accidental activation of the platform is impossible, as two switches need to be pressed simultaneously on the remote or control panel, and the control system of the platform in mechanics pit is designed according to Australian / New Zealand Standards Category III AS402. The platform will not move if the remote signal is disrupted, or if the circuitry has failed. The platform in mechanics pit is individually designed to suit existing workshop pits and to meet individual workshop requirements.